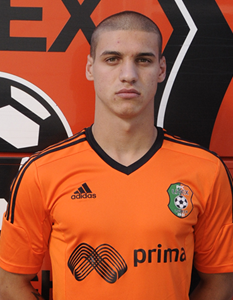 Kiril Despodov joined Litex Lovech’s youth academy in 2008 from a small team Pirin 2001. He’s currently considered to be one of the biggest prospect in Bulgaria. He made his first team debut under Hristo Stoichkov’s management, aged just 15 years and 183 days, in a 5–0 league win over Kaliakra Kavarna on 12 May 2012, coming on as a substitute for Svetoslav Todorov. He scored his first goal on 10 August 2013, netting the fifth in a 5–1 away league win over Pirin Gotse Delchev. On 7 February he Despodov made his first appearance for Bulgaria national team, in a goalless draw against Romania in a non-official friendly match, coming on as a late substitute for Stanislav Manolev. Currently, he is one of the youngest members of Bulgaria’s Under-21 squad.